* DNA from skeleton matches two of Richard III’s maternal line relatives. * Individual likely to have been killed by one of two fatal injuries to the skull – one possibly from a sword and one possibly from a halberd. * 10 wounds discovered on skeleton – Richard III killed by trauma to the back of the head. Part of the skull sliced off. * Radiocarbon dating reveals individual had a high protein diet – including significant amounts of seafood – meaning he was likely to be of high status. * Radiocarbon dating reveals individual died in the second half of the 15th or in the early 16th century – consistent with Richard’s death in 1485. * Skeleton reveals severe scoliosis – onset believed to have occurred at the time of puberty. 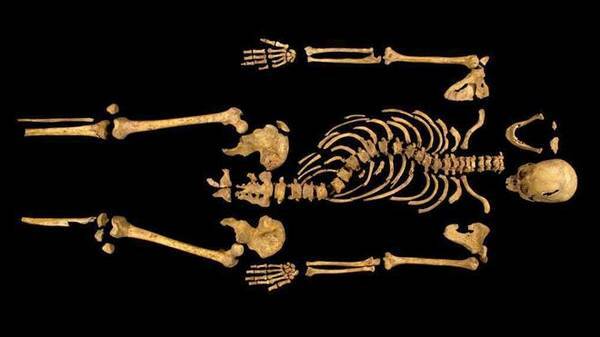 * Although around 5 feet 8 inches tall (1.72m), condition meant King Richard III would have stood significantly shorter and his right shoulder may have been higher than the left. * Feet were truncated at an unknown point in the past, but a significant time after the burial. * Corpse was subjected to ‘humiliation injuries’ –including a sword through the right buttock. * Individual had unusually slender, almost feminine, build for a man – in keeping with contemporaneous accounts. * No evidence for ‘withered arm’ –as portrayed by Shakespeare – found. * Possibility that the individual’s hands were tied. * Grave was hastily dug, was not big enough and there was no shroud or coffin. There was a daft documentary on Channel 4 to big-up the announcement. The presenter strode through the ruins of the king’s castle in Yorkshire, booming out, “Now is the winter of our discontent …” The ardent lady who had proposed the archaeological dig seemed overwhelmed by the camera, although it was clear she had put a lot of thought and effort into the investigation. Plus comedy gold in the trench, when an archaeologist in a white bio-hazard suit solemnly admitted she had … smashed the royal skull with her pickaxe. Showbiz aside, this is a satisfying achievement for historical and scientific methods of inquiry, but I reckon the findings may disappoint some people. Analysis of the king’s remains supports the probability of several assertions that were doubted by the Ricardians: the king was a hunchback, contemporary accounts of the battle are accurate, and the propaganda portraits made of him after death are a true likeness. Probably. All that’s left is to figure out where the remains will be reinterred: Leicester or York. Leicester, I’d say. Catholic rite? That’s a dilemma for the Queen and her new archbishop. The radiocarbon results were adjusted upon evidence of high protein consumption: eating marine animals (shellfish) absorbs C14, so the time frame was bumped up by about 50 years. Otherwise the date of death would have been before 1485. I assume that’s an established method, but the documentary didn’t explain. No doubt it’s down to statistical probability, which is an interesting problem for the standard of proof in historiography. The story that the king’s corpse was discarded in a river started with an account from 1608 by a historian (not Stowe? ), who visited the area in search of the grave. He found nothing and felt confident in repeating some local tradition. Turns out he visited the wrong place.